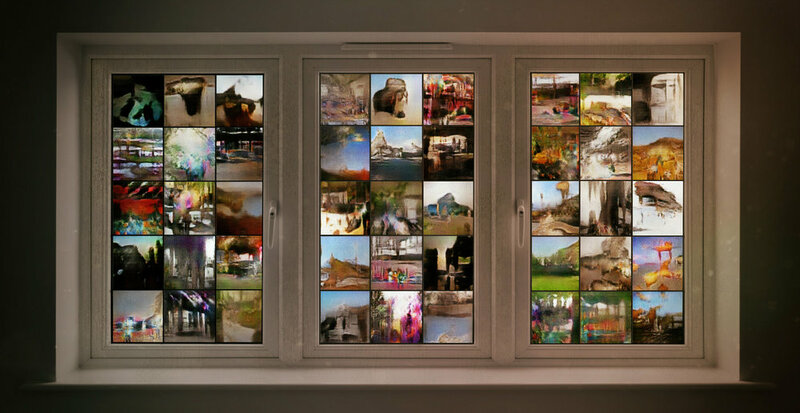 An AI system was used to ‘dream’ the places behind the windows in this artwork. Although the machine generated imagery in itself might be pleasing, what fascinated the artist the most is human imagination about what these semi-abstract visuals represent. Imagination might just be what separates man from machine. The piece is inspired on Duchamp’s window artworks that were a reference to the end of literal pictorial depictions in art in the twenties of the last century. Duchamp’s window art pieces paved the way for a more conceptual form of art. The artwork ‘Newborn Widow’ combines human imagination and creation by AI, which quite probably is exemplary of the roles humans and machines will have in the world of tomorrow and specifically art.